A week or so ago, UK-based author Mitch Peeke sent me this story of a recent unplanned visit to his old gliding club. While I’m sure it stirred up memories for Mitch, it also brought the magic rushing back from my own Saturdays with the Adelaide Soaring Club. It seems the charm of sunshine, dry grass and sleek sailplanes is the same the world over. My foray into soaring was all too brief, victim of a pace of life that seems largely incompatible with gliding. But it was enriching and I hope I’ll be back between those great white wings one day. Glider Club Memories from the 1970’s. Article and photos © 2018 Mitch Peeke (except © Kent Gliding Club, as noted). This all started whilst I was out for a pleasant summer’s afternoon ride on my Harley. 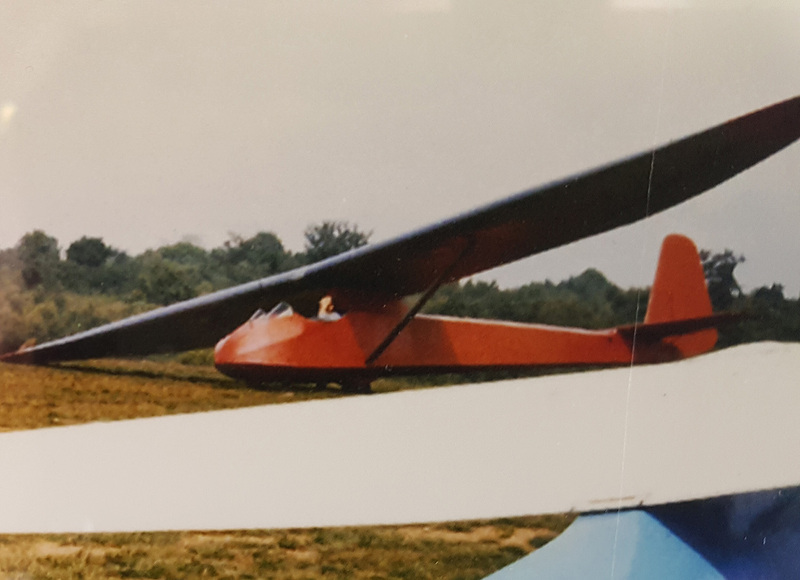 I found myself on the old A20 outside of Lenham and on a whim, I headed for my old Glider Flying Club, curious to see if it was still in existence forty years after I was last there. Storming up Charing Hill on the A252, I saw a sign, which simply said GLIDING CLUB. Slowing down, I swung sharp right and rode down the narrow lane which led to the airfield. As soon as I arrived, the place was so familiar. There have been some changes, yes, most notably the hangar area, as there is a workshop building alongside it now. I parked the Harley by the clubhouse and wandered inside. Having explained I was an ex-member, I was made most welcome and I spent an hour and half talking with members and going back over old times, though there were not many members left from when I was there before. I was a member of the Kent Gliding Club from 1976 to 1978. I was 14 years old at time of joining. One of my ATC Squadron mates was Corporal Dave Griffiths, who was a KGC member at the time and it was he who got me into the club. Dave was I think about 18 or so then and he had a Purple Triumph Herald car, which is how we used to get to the club from Sidcup, via the then still incomplete M20! Going flying invariably meant getting up at 04:00 on a Sunday morning. Fine in the summer, but as the year wore on, it could sometimes lose its appeal! We used to arrive at the 200-acre Challock airfield at 06:00 on a Sunday. First job was to get the two red Massey 35 tractors out of the hangar and fuel them up, by the disgusting expedient of siphoning diesel out of the big tank by the hangar, with a length of garden hosepipe! After ingesting/fuelling, it was time to round up the sheep and put them back in their pen as they were the club’s overnight grass mowers. The very first time I went to the club, Dave gave me my first ever driving lesson on one of the two tractors, which lasted precisely three minutes and consisted of “On the right, there’s the brake, kick it off from parked position, lock it down to secure once stopped. On the Left there’s the clutch, go easy or ground loop! Throttle is the stick under the steering wheel. 3rd gear flat out for most jobs, 2nd gear idle for towing aircraft. Don’t use 1st for anything and don’t sit down!” (No suspension). And that was it. The rest I picked up purely through practice and chasing sheep! After “the great round up”, we would return to the hangar, there to pick up the cable retrieve trailer, then it was down to the winch. Once at the winch, Dave would start it up and warm it whilst I inspected the cables’ parachutes and weak links before I stuffed them into their respective bins on the trailer and then ran the cables out across the airfield to the launch point. 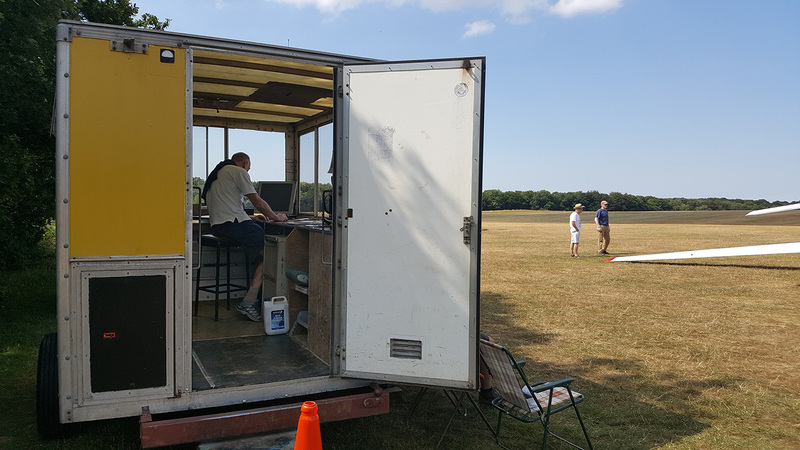 With the cables duly delivered, I would go into the launch control van and call Dave to test the field telephone, an old-fashioned crank handle device, to make sure the sheep hadn’t munched through a cable on the perimeter fence overnight! At about 07:00, other members would begin to arrive and D.I. the aircraft so the day’s flying could start. Then it was time to tow the aircraft out to the launch point. The two T21’s, “Cirrus” and “Kermit” to the winch launch side and the Capstan (number 49 on its tailfin) to the aero-tow side. The tug pilot was usually around by then. The tug was a silver Jodel D140 and was fuelled by hand pump off the bowser trailer, from two big yellow barrels of Shellmex Avgas. The aircraft was then warmed up and taxied up to the aero-tow launch point. My day then usually consisted of a stint driving the cable retrieve, a stint retrieving aircraft after landing, or towing other members’ aircraft up to the launch point, a stint as launch point signalman on the winch side, a stint in the launch control van and other dogs-bodying duties! My reward was three winch launches late in the day, in one of the T21’s, average flight duration of three minutes each, unless conditions/time constraints were right for soaring, either from thermals or from being able to use the updraught from the chalk pit at the bottom of the ridge on the south side of the airfield, and I literally lived for every second of those short flights!! In the summer of 77, the club held an open day, so I was able to bring my family to the field for the day. That was how my Dad found out I could already drive, aged 15! He took the photo of me by the launch point after I had towed an aircraft back. My Mum, Dad and Brother all got a flight each and my Brother got the longest one of the lot! He went up mid afternoon in the club’s new, blue-green K13 and the thermals were strong. He was up for nearly an hour! I got up in one of the club’s other new Gliders, a used L13 Blanik. Lovely all-metal aircraft that was, with an enclosed cockpit, flaps and a retractable landing wheel! So much sweeter than the heavy, wooden, open cockpit T21!! Later, I did a week long residential course at the club in the summer of 1978. My main instructor was Terry Bramfitt but also Tony Goodman sometimes. That’s when I really began learning to fly. “Keep the Pitot tube on the horizon whilst turning” Terry would say and I would try but I was still a bit heavy-handed/ham fisted to say the least!. Tony was an ex-RAF flying instructor and would be far more blunt: “What the bloody hell are you doing?! !” he would say after yet another of my overly steep turns. “Give her to me! Now; like THIS, PA-LEEEEASE!” I got it eventually! I well remember spin training in Kermit (so named because it was painted dark green and with the two little screens on the front of the cockpit, it looked like a frog from the front) with Terry, an utterly amazing sensation! Using a combination of ridge and thermal soaring, we got Kermit up to an unprecedented (for me!) height of 3,000 feet. Then Terry eased the stick back till Kermit stalled and dropped the left wing. Over and down we went, dead vertical, with the ground rotating clockwise at our feet! I thought we were going straight in! Then Terry pointed to the ASI. “How do we do that?” I asked, urgently! He wasn’t wrong. The ASI hit 60 knots almost immediately the spinning stopped. Terry hauled the stick back and we came out of the screaming dive, wings creaking and bending, climbing to regain some of our lost altitude, with Terry laughing his socks off! More thermalling to gain height, then Terry said “Now its your turn!” and I had to induce the stall and spin then recover, which I’m pleased to say, I did. And of course there was my first, unforgettable, landing. I put Kermit down just as Terry had shown me and was so pleased with myself that I let go of the spoiler handle too soon and we got airborne again! Running out of field, Terry quickly pulled the spoilers out again, put her back down and managed to bring her safely to a halt about thirty feet from the trees at the ridge end of the field. “Note to self?” he calmly said. “Errm, Don’t let go of the spoiler handle till we stop?” I said. I got the chance to go up by aero-tow in the Capstan a couple of times too. Saying goodbye to the tug pilot at 1,500 feet as he went into a diving turn to port whilst we turned to starboard was all very civilised. I passengered in the tug once too, to show me what it was like from the other end of the cable. All in all, aero-tow was a far different experience from the dramatic effects of a winch launch! I have never forgotten that feeling of eager anticipation felt when sitting tightly strapped (we used to say that if you could breathe, the straps were too loose!) into the wooden seat in the cockpit, watching the steel cable tightening through the grass as the slack was taken up by the winch driver, out of sight on the other side of the airfield. Then the sheer exhilaration of “ALL OUT!” as suddenly you are airborne and climbing hard into the sky, with the stick back in your stomach doing 55 Knots at a 45 degree angle, watching the wingtips bend upwards! If it had been a good launch, you pulled the release with about 900 feet on the altimeter, A sharp BANG then an appreciable slowing and almost silence, nothing now but the sound of the wind over the wings. Heaven! A look over the edge of the open cockpit showed the Farmer’s Land Rover below, no bigger now than a matchbox! Check instruments: ASI shows 32 Knots, Variometer shows 2 Knots down, normal status for a T21 in flight with no rising air under the wings. Losing height all the time meant that it was time to plan the circuit immediately. No option of going round again if you sod this up! On the downwind leg, checks for landing, though the T21 had a fixed wheel and tail skid and no flaps to use. Final turn, then straighten out, Spoilers fully open now. She shudders as the airflow over the top of the pylon mounted wing is deliberately ruined to lose height quickly. “Pick your aiming point on the grass” says Terry the instructor. A little flare out on the stick and…BUMP, followed by a lot more vibration and a constant rumbling. No luxury of a spring-loaded, hydraulically damped undercarriage here, just the solid mainwheel rolling over the sun-hardened and not terribly even, grass field. We roll to a halt as one wing drops slowly to the ground. Out we both hop and turn her around by hand as the retrieve tractor arrives to tow us the remaining distance back to the launch point. After a day of this, it was time to pack everything away again and retire to the convivial atmosphere of the clubhouse, there to go over the whole day’s events from everyone else’s perspective! Then, if it was a Sunday, time to head home around 21:30 (school in the morning!) and look forward to doing it all over again next week! In the two years I was a member, I also learned to D.I. the T21, to splice broken cables and to drive the King Arthur winch, which meant learning some of Mr Goodman’s “other” hand signals if the speed sometimes wasn’t quite to his liking! 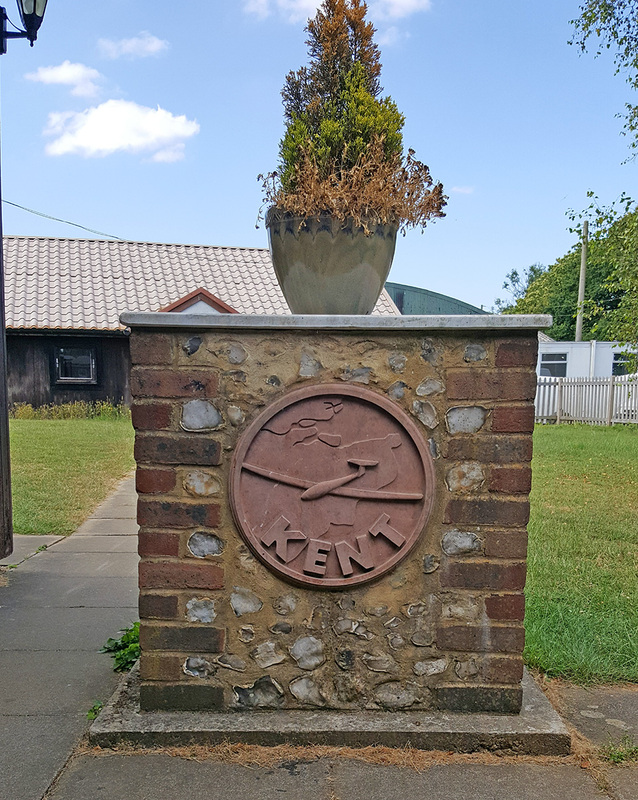 Kent Gliding Club was founded on 4th January 1930 and documents show it to be the first BGA club to be formed. 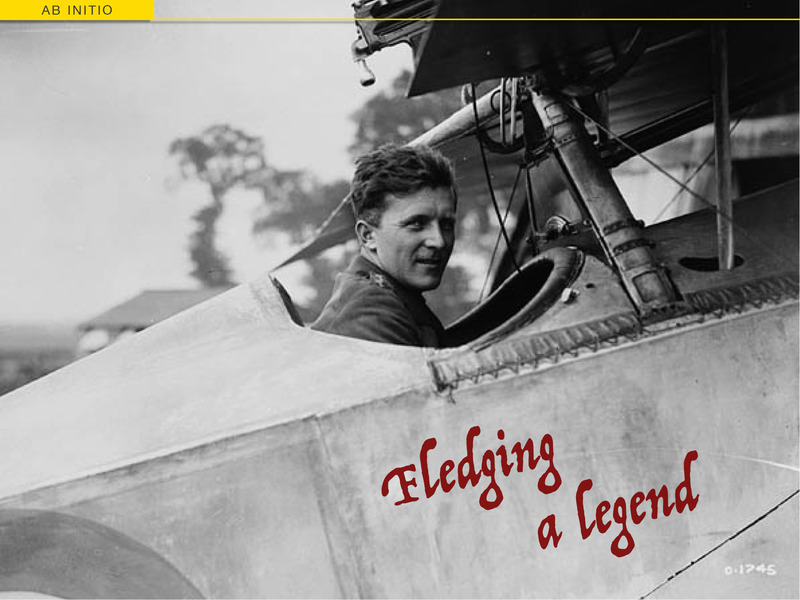 Founder member Jimmy Lowe-Wilde not only gained Britain’s first gliding certificate, he also built the first glider to be registered by the BGA – a Primary affectionately called Columbus. The club flourished during the 1930’s with gliding at a number of sites, but mostly at Lenham and Eastchurch. Due to the 1939-45 war this activity was unable to continue. The Club as we know it today was re-formed on April 26th 1956 with the amalgamation of the Royal Engineers (R.E.) Gliding Club and the new Kent Gliding Club, then based on the old Battle of Britain airfield at Detling. Since then we have flown at a number of other Kent airfields, including West Malling. In May 1961 the land at Challock was purchased but it was another two years of preparation before the field could be used for gliding. We were at that time one of the few Clubs to own its airfield. At 14:00hrs on 15th June 1963, the first flying activity took place with the landing of Chief Flying Instructor Roy Hubble who was followed by the rest of the fleet – all towed from West Malling by Tiger Moths. The club house was built and officially opened on the 21st August 1965. 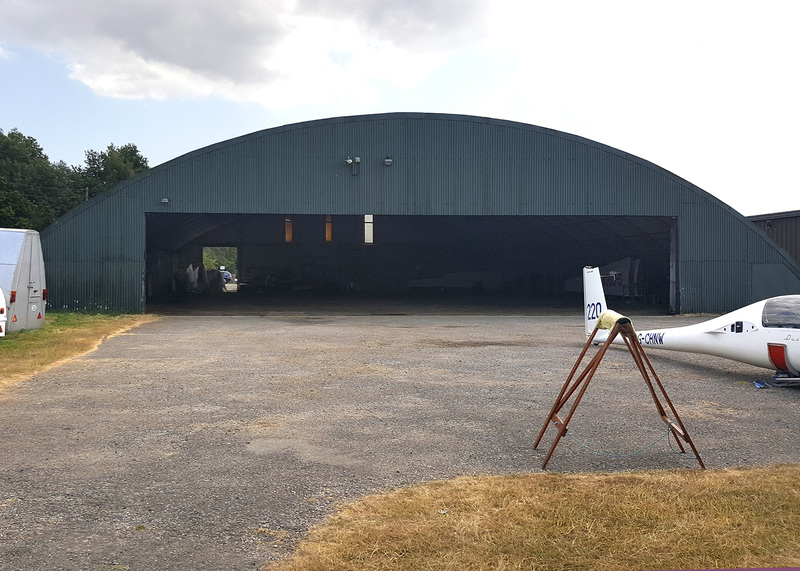 Kent Gliding Club became fully operational at Challock with regular weekend flying and a few holiday courses.Over the years we have constantly reviewed our operations and re-equipped with gliders and tug aircraft to remain efficient. The club now operates 7 days a week from 1 April to 31 October and on Wednesdays and at weekends during the rest of the year. Finally, I would like to say a big ‘Thank You’ to all those members of the KGC who welcomed me back twice, gave me permission to ‘Access all areas’ and provided memory joggers and photos. Keep ‘doing it quietly!’ guys! I lived in the area for a number of years and no doubt saw one of your gliders high in the sky. It’s a beautiful part of the country to be soaring in. It certainly is a beautiful part of the county, thankfully with some conspicuous geographical features! Once up, we used to navigate by following the main roads with a standard road atlas folded into a clear pocket on the left thigh of our green flying suits. If the Luftwaffe can do it so can glider pilots! It Certainly my is beautiful. I have one of those flying suits! I’m not Luftwaffe, so I must be …old! Nuts! David, you MUST post a photo of yourself dressed in it! Aircraft flying in the sky pics looks really good. Thanks. I hope you’ll find plenty more of interest here.